My friend Lisa got me started on another project. ya just what I need right? well this one grabbed me even more because it "reuses" something. old windows and broken stained glass. If you know me, I am a sucker for old farmhouses, old antique anything and reusing material. 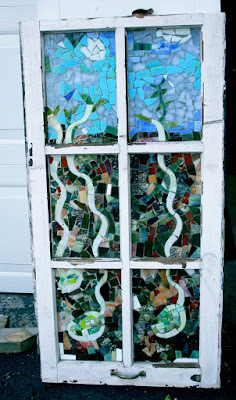 And old windows are just plain beautiful. the look, the touch, the smell, ok-maybe not the smell. So my friend Jenn and I took Lisa's starter class last week, and of course we are hooked. My daughter took it with me and did great. Everyone admired her lack of fear while creating. I will post hers later. This project is easy because you are resuing 2 things. the window frame, and the broken sheets of stained glass. You use a glass cutter to nip the pieces into little pieces and silicone glue them to the window glass. I have had this lima bean imagery in my artwork lately. So I used that with the stained glass. Little lima beans sprouting up through the dirt. pushing up to the sky. I love it! not sure where it will go yet. Now on to window number 2! !